Lachha paratha is a popular Indian flat bread that’s flaky with mutiple layers, crisp on the outside with soft interiors. 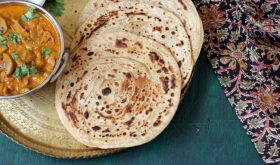 Usually prepared with whole wheat flour or atta, this layered paratha has its origins in Punjab and is also known as lachedar paratha. 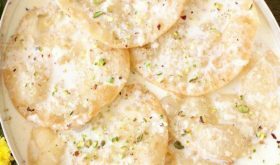 Very popular in North India and the famed paranthe wali gali (street of parathas) in Old Delhi has street vendors dolling out a variety of Indian flat breads with lachha paratha being one of them. 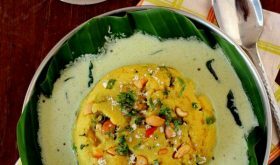 Earlier I had posted a recipe of south indian street food special, parotta, a flaky layered flat bread made with all purpose flour or maida. 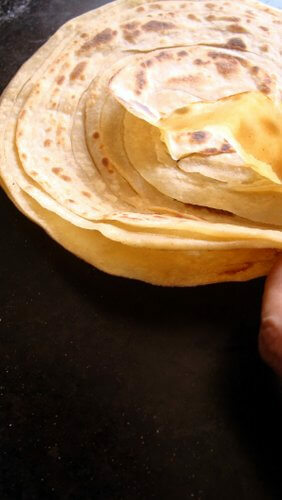 After I posted it, there are many requests to post north indian lachha paratha recipe with atta. I am sharing a step by step tutorial for making a perfect lachha paratha at home quite effortlessly. I have prepared lachha paratha with whole wheat flour, though you can use a 50:50 ration of all purpose flour and whole wheat flour. The mixed flour dough yields a slightly more softer texture. Having said that, making lachha paratha with only atta is equally good and healthier as its full of fibre and a low glygemic index. Lachha paratha ingredients include atta, salt, oil and water. You can use either oil or clarified butter aka ghee. Vegans can go with oil. 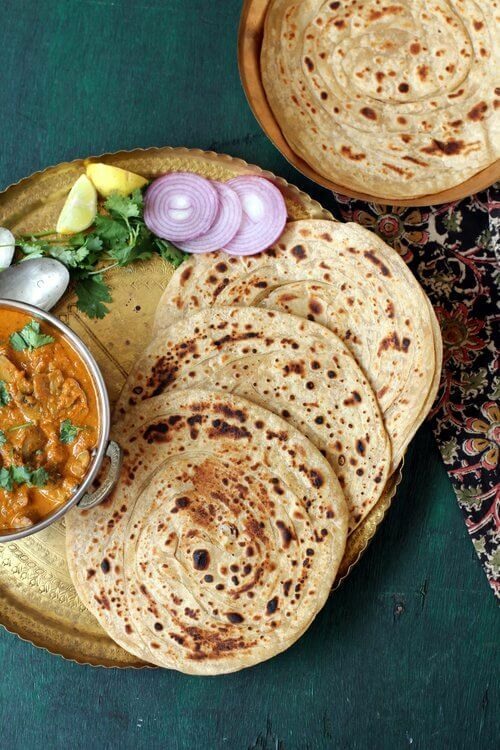 If you follow the below step by step method to make lachha paratha, you are sure to achieve flaky, delicate soft inner layers with a crisp exterior flat bread prepared with dough that has no baking powder and without egg. In a bowl, add whole wheat flour and salt and mix well. Add a tablespoon of oil or ghee and mix into the dough. 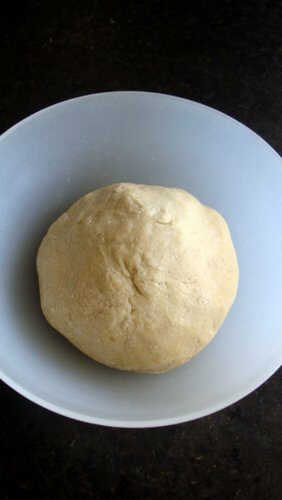 Slowly add enough warm water to make a soft dough. Knead for a few minutes and allow the dough to rest for 10 minutes. Pinch out lemon sized balls off the dough and roll them into a smooth ball. Place one ball of dough on the working surface and dust the working surface with flour. Roll out the dough into a 7″-8″ diameter flat circle. Drizzle one or two teaspoons of oil or ghee and smear it all over. Sprinkle a little flour all over. The greasing and dusting will yield a flaky paratha. 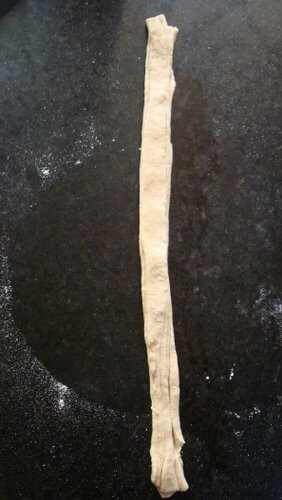 Staring at one end of the circle, begin folding the rolled out flat bread into 1/2″ pleats. 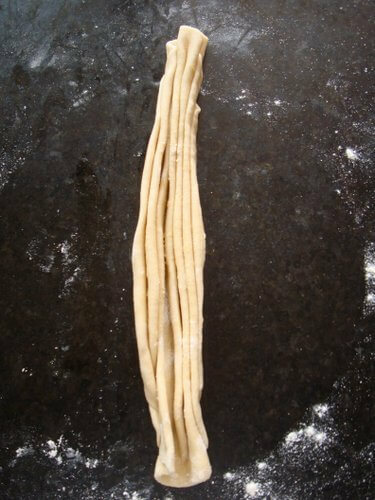 Once the pleats are formed, clutch the ends and swing it lightly in the air so that the pleated dough stretches in length. Begin at one end to twirl it around to form a spiral/coil like a swiss roll. 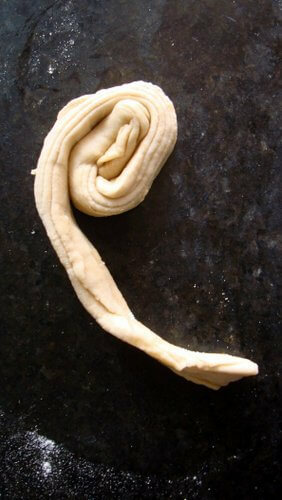 With the rest of the remaining dough, make more spirals and set aside. 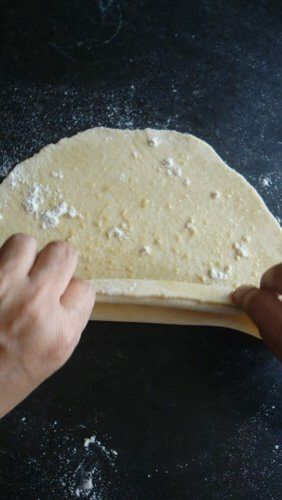 Place the coiled dough on the working surface, dust with flour. 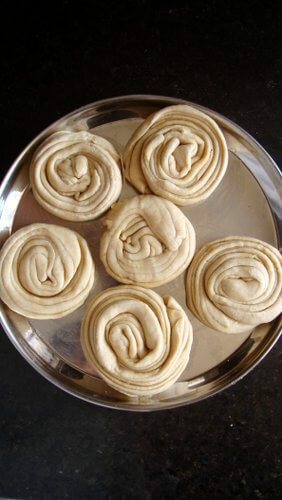 Roll out the dough into 7″-8″ diameter circle, smear with one or two teaspoons of oil or ghee and sprinkle some flour. Begin to pleat from one end of the circle to form a lengthwise long pleat. Stretch it lightly and form a coil shape out of it. Once all the coils are prepared, allow to rest for 30 mts by covering with a damp cloth. 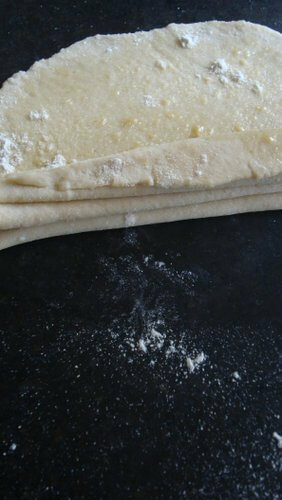 After resting, place a coiled dough on the working surface and dust it with flour. Roll out into a flat round 7″ diameter circle and place on a pre-heated iron tawa or griddle. Ensure that the griddle is hot before placing the paratha to shallow fry. Allow to cook on medium high flame for 20 seconds undisturbed before flipping it over. Now cook for another 20 seconds and flip it again and cook till brown spots appear. 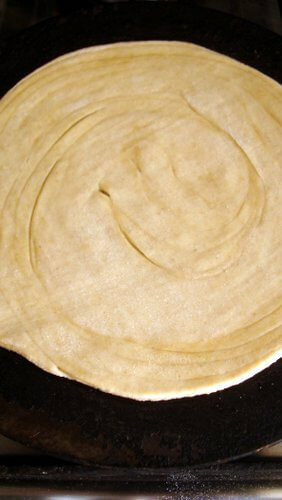 Use a flat ladle to press the paratha allowing the layers to form and puff up. Flip once again, drizzle some oil or ghee and roast for a few more seconds before flipping over to the other side and roasting it till well browned and layers appear. You can gently crush the paratha to expose the inner soft layers. 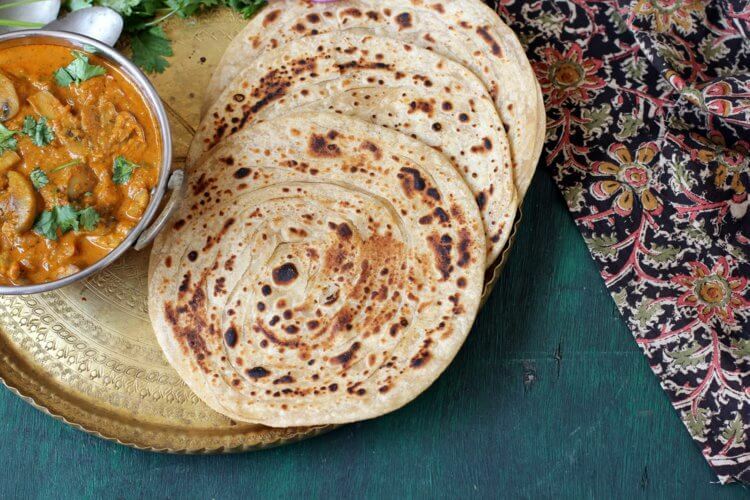 Lachha paratha is best savored hot off the griddle along side a side dish like palak methi paneer, palak paneer, dal makhani or mushroom masala. 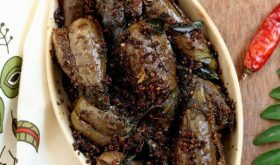 You can serve it for breakfast, brunch, lunch dinner as it makes for a complete meal when served with a curry, pickle or yogurt. If making ahead of dinner or lunch time, make all the lachha parathas, wrap the parathas in a kitchen towel and set aside. Alternately, you can freeze them and warm the parathas as and when required. 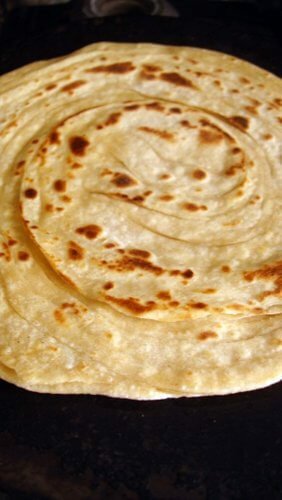 If you’ve never tried making lachha paratha at home, please give it a try. Once you make it, I’m sure you will not want to order a take away next time. 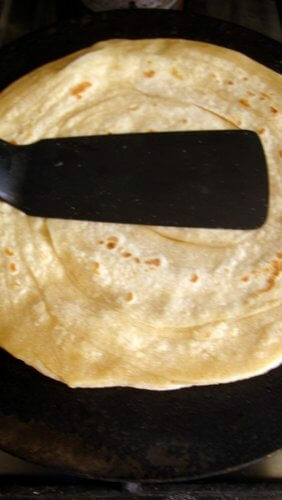 Nothing to the beat the aroma and flavor of piping hot homemade lachha paratha hot off the griddle! In a bowl, add atta and salt and mix well to combine. Add a tbsp of oil or ghee and rub into the dough. Slowly, add enough warm water to make a soft yet firm dough. Knead for a few minutes and allow to rest for 10-15 minutes. Pinch out small lemon sized balls off the dough. 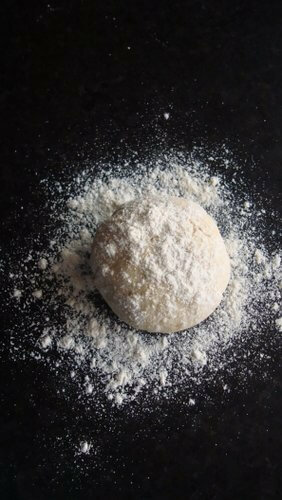 Place one ball of dough on the working surface and dust with flour. 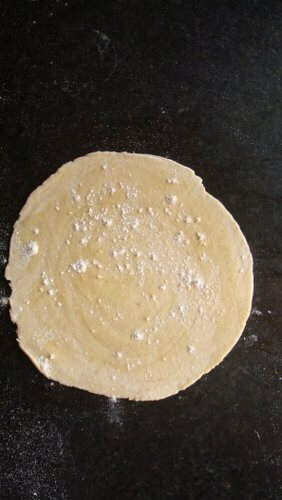 Using a rolling pin, roll out the dough into a 7"-8" diameter flat circle. Drizzle 1-2 tsps oil or ghee and smear all over. Sprinkle a little flour over the greased paratha. 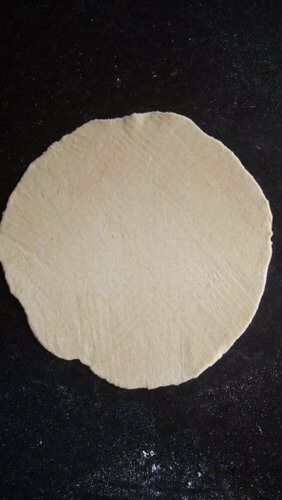 Staring at one end of the circle, begin folding the rolled out flat bread into 1/2" pleats. 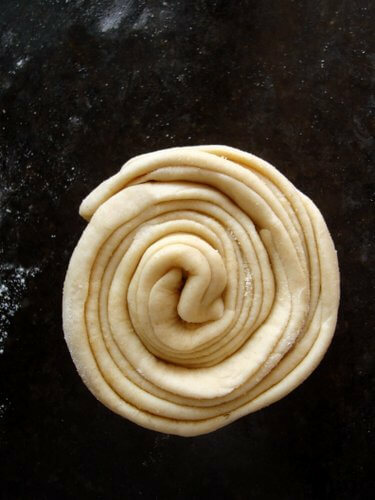 Make more spirals with the rest of the remaining dough. 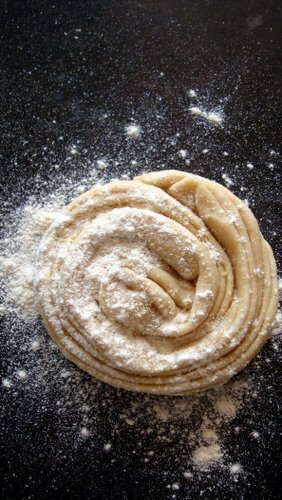 Place a coiled dough on the working surface and dust with flour. 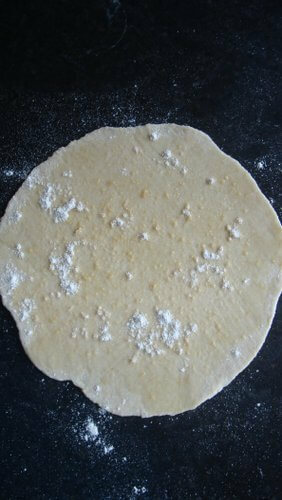 Roll out the dough into 7"-8" diameter circle, smear with 1-2 tsp oil or ghee and sprinkle some flour. Begin to pleat from one end of the circle to form a lengthwise long pleat. Stretch it lightly and form a coil shape out of it. Once all the spirals/coils are prepared, allow to rest for at least half an hour by covering with a damp cloth. After resting, place a coiled dough on the working surface and dust it with flour. Roll out into a flat round 7" diameter flat circle and place on a pre-heated iron tawa or griddle. Ensure that the griddle is hot before placing the paratha to shallow fry. Allow to cook on medium high flame for 20 seconds undisturbed before flipping it over. Now cook for another 20 seconds and flip it again and cook till brown spots appear. 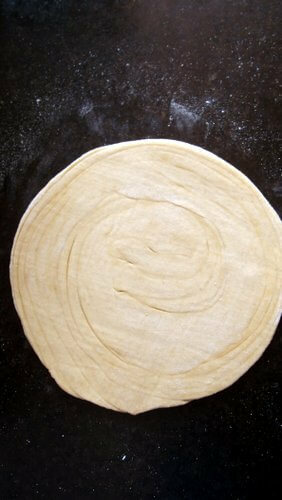 Use a flat ladle to press the paratha allowing the layers to form and puff up. 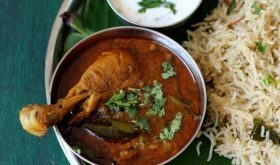 Serve warm with dal makhani or palak paneer or mushroom masala or any curry of your choice. 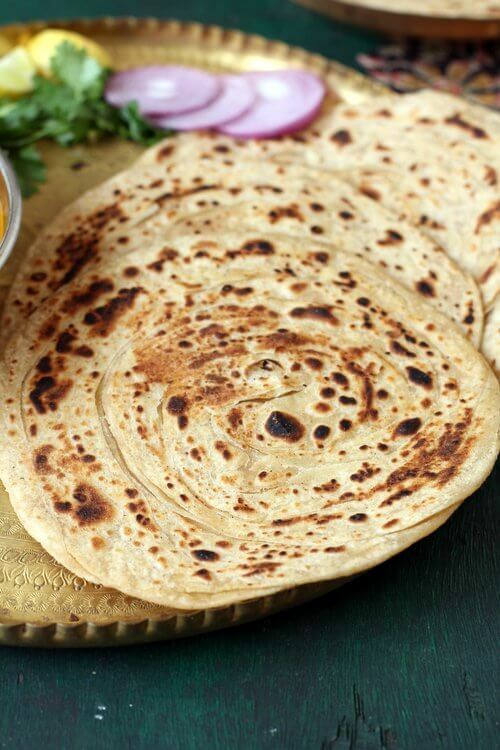 Ghee or butter gives a distinct aromatic flavor to the paratha. You can use ghee instead of oil. You can add 1/2 cup of warm milk along with some warm water. 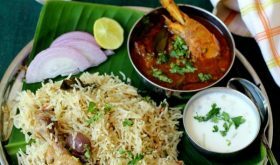 Vegans can avoid ghee and milk. Looks delicious! I’d love to try making this flatbread. This paratha is quite popular in Karnataka and Kerala. One can’t find the stuffed parathas in regular hotels of these areas. Do you recommend putting just water, or half milk and half water, in order to achieve the maximum flavor? Won’t the dough get dried out if you roll it again and again?